Duffy struggled to find the right model for his start-up accelerator before hitting on the concept of a “social enterprise” (the UK equivalent of a not-for-profit). That done, he quickly recruited the support of a couple of wealthy backers and opened for business. Entrepreneurial Spark isn’t chasing rainbows in the sense of finding businesses that will grow to immense value. If one of the “chicklets” in its “hatcheries” (Duffy enjoys corny gags) becomes the next Google, that would be fantastic. But eSpark contents itself more in the nitty-gritty of helping people turn even the simplest business idea into reality. The concept has attracted a lot of attention from politicians hungry to find communities new sources of jobs, and from business people who know only the private sector will lead western economies out of the current low-growth fug. Here I must declare an interest. My company, TVI Vision, has produced an observational documentary series – The Entrepreneurs – for the BBC. Our team has followed several of the group as they have tackled starting-up. As soon as I met Jim Duffy I knew we had to film his progress. There is a plethora of ideas. From a young guy who’s developed a “healthy pizza” to a range of businesses offering children’s care services, software solutions, sales training, and so on, eSpark has tapped into a bubbling mass of ideas. Recent statistics have shown that the greatest job creation in the UK lately has been self-employment, and Jim Duffy’s enterprise is proof of that. Is it working? Those of us who’ve followed business start-ups know that the failure rate during those vital first three years can be stubbornly high. Duffy’s solution to that is that entrepreneurs should be allowed to “fail fast, fail cheap” if only they learn from their mistakes next time round. Is the concept working? Duffy points to the first year’s stats, which show promise: The first group has achieved combined sales of £3.55 m, and attracted investment funding of £2.56 m. In total, 139 people entered the accelerators, and 194 jobs were actually created. The real test will be the survival rates of those businesses. Duffy is under pressure to continue expanding, with new centres around Scotland. To do that he needs to build an infrastructure that continues to build on the quality of advice and support provided. He is wary of diluting that impact. Stateside, Babson College and Mass Challenge are both involved in helping eSpark. Duffy’s enthusiasm is hard to resist, and numerous high-profile people such as Ann Gloag (co-founder of the transportation giant Stagecoach) have found themselves agreeing to volunteer as mentors and funders. “Entrepreneurialism is a bumpy ride, but the people who succeed are those who adapt and survive, and learn to thrive in any circumstances,” says Jim Duffy. PS: Take a look at the eSpark website, and that of its client companies, a few of which such as Mallzee, Clear Returns, Desk Union and Coolside typify the type of businesses involved. 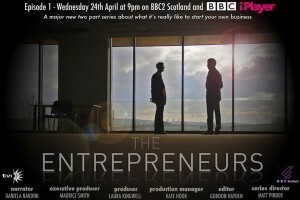 If you live in the UK, our documentary, The Entrepreneurs, is being broadcast on BBC TWO Scotland on April 24 and May 1. If you live in England, this can be found on Sky satellite or online via the BBC iPlayer. And if you live in North America, please lobby PBS or someone to bring it over the Atlantic.